Which is why we're celebrating love in all its forms and all its sometimes-complicated joys not just on Valentine's Day (Feb 14th), but all weekend long. Our dramatic underground lair was positively born for Valentine's Day. So from special food and drink options to live music to a beautiful sparkling-light atmosphere, we're pulling out all the stops for the entire weekend, from Thursday the 14th all the way through Sunday the 17th. It's not too late to start planning your date, so now's definitely a good time to score a reservation for one of our most sought-after times of the year. 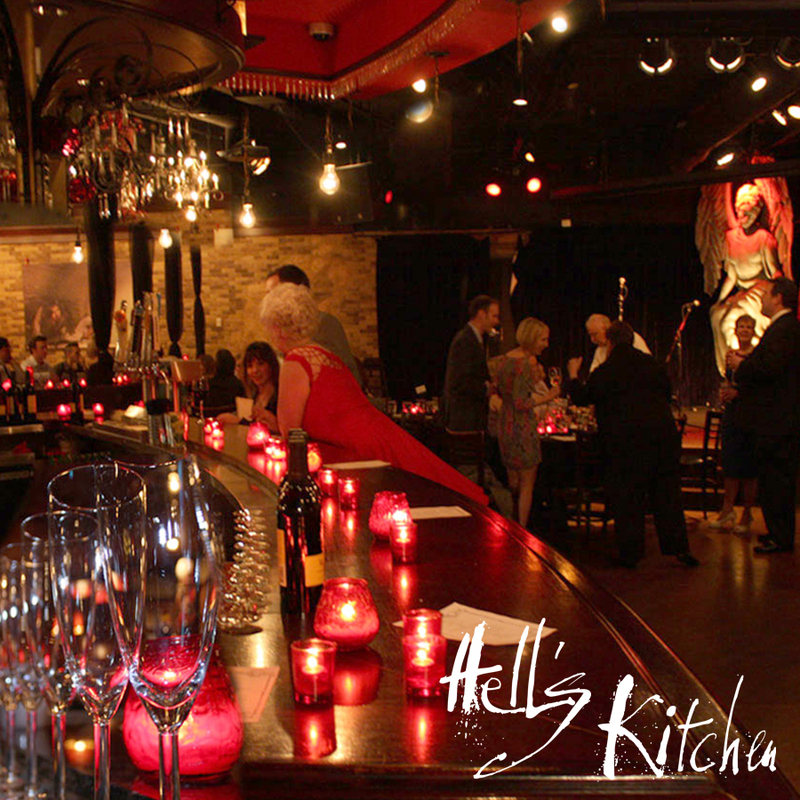 We’re guessing most of you have experienced our energetic and packed Weekend Brunch, so it probably strikes fear in the hearts of some people thinking about coming to Hell’s Kitchen for a relaxed, romantic Valentine’s Day. But fear not, because for this special celebration, rather than the fun chaos of a weekend brunch, Hell’s Kitchen slows things down and turns into an entirely different experience. We'll dim the brights, gussy up our space (and ourselves), and most importantly, space reservations far enough apart so you can enjoy a beautiful, calm dinner with your loved ones. Trust us, we get it. Valentine’s Day lands on a Thursday and that might not be ideal. Maybe you’ve got work early the next morning and can’t be out that night. Maybe you’re a server who wants to celebrate with your sweetie, but doesn’t want to give up your lucrative v-day shift. Because everyone deserves a chance to celebrate, we’ll be going all-out every evening from Thursday (Feb 14th) through Sunday (Feb 17th). So make a reservation for whichever date suites you best, and rest assured you’ll be getting the full Hell’s Kitchen Valentine’s experience. People think our chefs are tough and grizzled, but really they’re big softies who love coming up with romantic dinner ideas. A ribeye with bacon-wrapped shrimp and asparagus? Yummmm. A sparkling cocktail made with house-infused Strawberry vodka? Yes please! Finish the night with house-made truffles? Umm…. yeah! Of course, we understand that many people want the Damn Good Food we’re known for, so rather than restricting your options, our full dinner, drink, and dessert menus will be available as well!